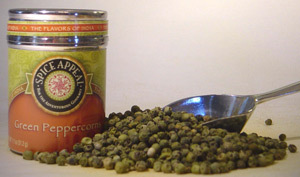 Known as the “King of Spices,” pepper is one of the oldest and most popular spices in the world. Harvested before maturity and air-dried, it has a fresh, clean and aromatic flavor without the sharpness of black or white pepper. Provides a pleasant flavor in gravies and white sauces for poultry, red meats and seafood. Enhances the taste of pates and terrines while adding flavor to rich foods like pork, duck and game.